Slip into a pair of the Dansko Harriet and enjoy it's stylish good looks and all day comfort. 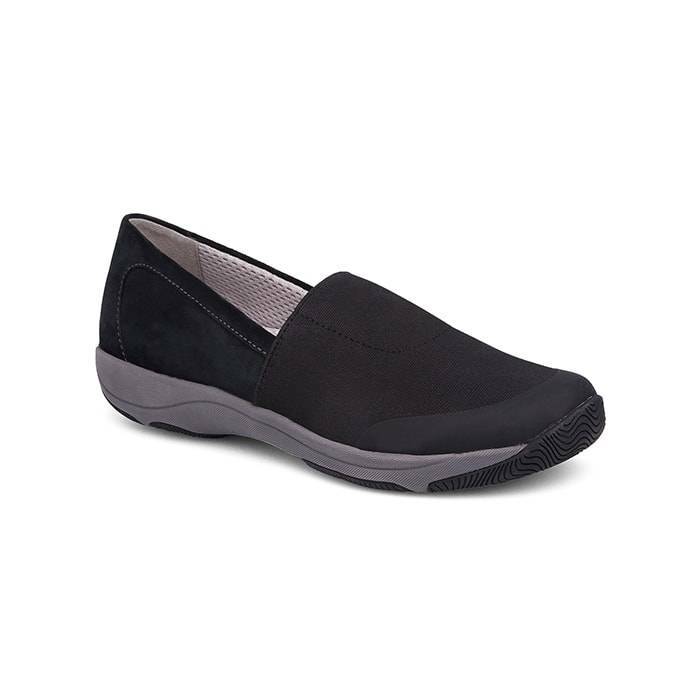 With the Dansko Harriet Black Stretch-Suede you can take it easy or take it on the go. you’ll barely know you’re wearing shoes. This shoe has a supportive, shock-absorbing midsole. It also has a long-wearing rubber outsole. In addition, a contoured and removable PU footbed provides memory foam and added arch support. Not to mention that you can easily slip into Harriet’s soft and breathable textile mesh lining. Like wise, you can stay fresh and cool because of the Aegis anti-microbial treated footbed. 3M Scotchguard™ stain resistant-treated suede upper with a stretchy vamp for a secure fit. Antimicrobial Aegis® treated lining and footbed for stain and odor control. Removable, contoured, memory foam-cushioned PU footbed with built-in arch support for ultimate comfort. Lightweight EVA midsole absorbs shock and adds support. Click To View All Dansko Styles.